The ocean side of Jersey is scattered with fresh donut joints. If you recall my first fresh donut post, you know Hubby and I go big when it comes to ordering and eating donuts. After the honeymoon period of this fresh donut discovery ended, I continued trying new-to-me locations with an attitude of, “They’re all basically the same”. It’s not true, of course, something which the files on my computer of donut joints I purposefully did not post about clearly shows. However, the good places all followed the same pattern: hot, fresh, cake donuts dipped in icing and sprinkled with toppings as you wait. Let’s just pause for a moment and give these donuts the attention they deserve. I’d started judging places by two things: 1.) their base donut and 2.) their method of topping. They are crucial. At several places the base donut, though good, was substantially smaller or thinner than others; many got sloppy with their toppings, or their icing was too thin, leaving the donut looking rather sad and pathetic. Which, in case you were wondering, does not photograph well. Purple Glaze, I’m happy to say, not only excels in both categories, but has raised the bar where fillings, icings, and toppings are concerned. For such a tiny spot in Asbury Park, I expected a long wait after we ordered our dozen. But their donut masters not only move with a cheetah like pace, they manage to do so with an artist’s perfection. 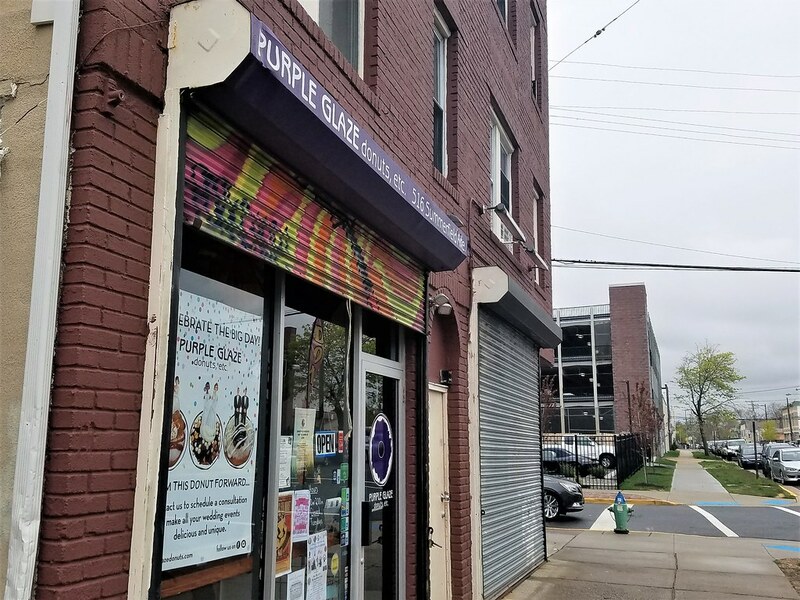 *Though, at Purple Glaze, the donuts in the fancy & filled section of their menu are so diverse, it would take quite a while for that selection to grow old. When I saw this display, I knew Purple Glaze was a place to love. And then when I saw that the staff wear donut pants, I knew we were going to have a relationship that lasts forever. I mean, come on, donut pants!!!!! Best work uniform ever. 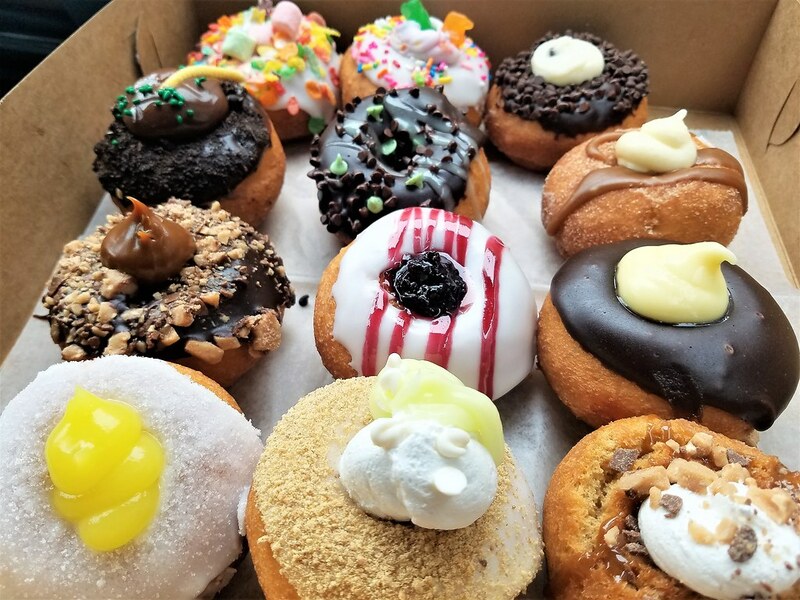 It is no easy task choosing from a bunch of awesome donut concoctions*, but somehow we managed. 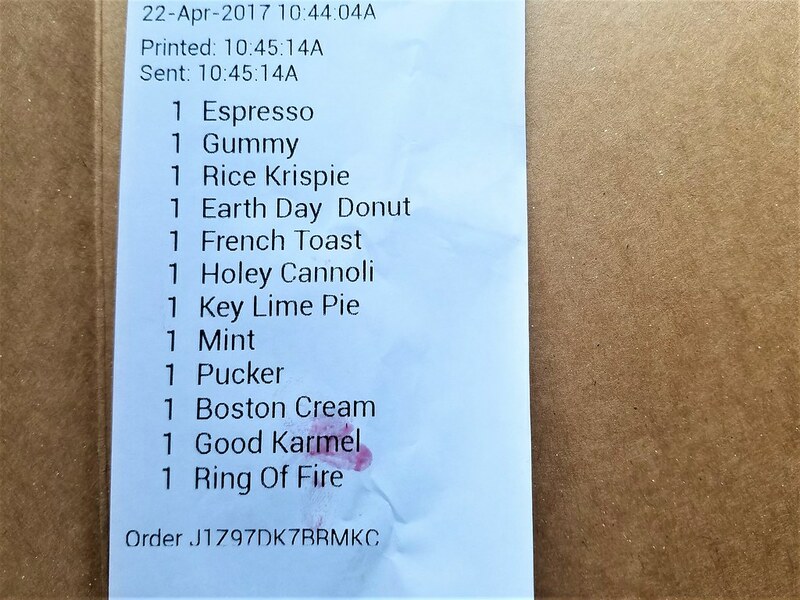 I loved that our receipt had our selection printed out so I could remember what I ordered. *And another trip might be in order asap because I saw on their Facebook page they have a “Brownie Sunday” donut as a special. It’s a devil’s food donut. People…a devil’s food donut! Chocolate lovers, where ya at?! You know how people describe food and say things like, “It was unlike any other donut I’ve eaten?”, and then you don’t really believe them because you’re like, How could it really be unlike any other donut you’ve eaten in the entire world, in your entire life? 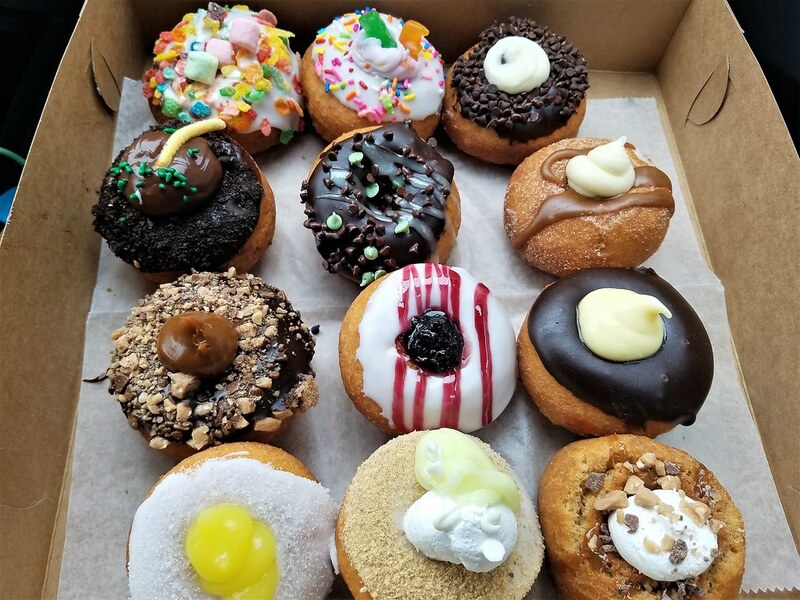 Friends, the quality of Purple Glaze’s donut toppings, icings, and fillings are unlike any donut shop I have frequented, and just a quick search on my blog will prove, I’ve frequented quite a few. Here’s what I mean, most donut places have an icing that is pretty much a combination of powdered sugar and milk, perhaps with a pinch of salt and little flavor like vanilla added. This standard icing formula is used on all their donuts. 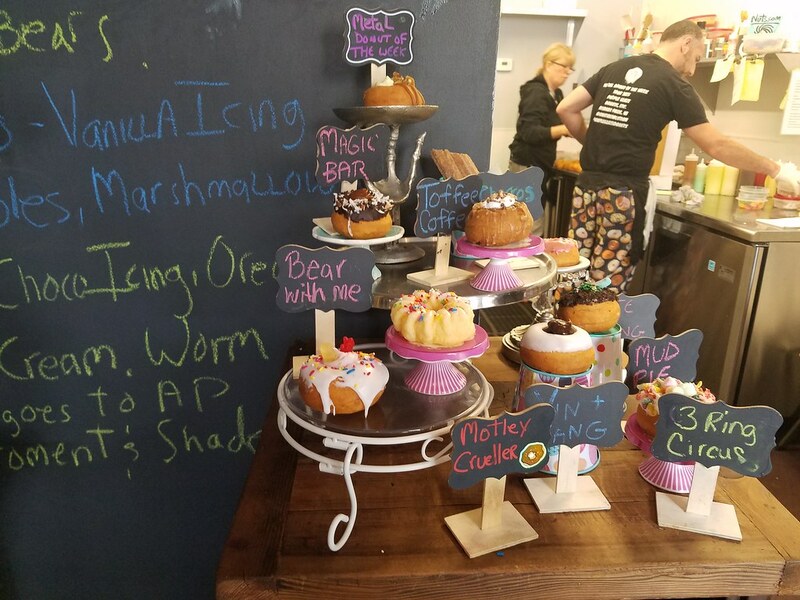 At Purple Glaze, there were donuts with icing from buttercream to rich, thick, chocolate to glazes like blueberry and maple. There were drizzles like mint, maple, and caramel and cream fillings of every sort you can imagine: real whipped cream, Bavarian, dulce de leche, mango, lemon, key lime…and I’m going to stop there because now my stomach is rumbling. I loved that their returning espresso donut was made from a different batter: espresso batter. Completely different from its donut brothers and sisters, I loved the change, and especially loved the coffee glaze and crunch of Heath bar sprinkled all over. Of our dozen, however, my two favorites were Good KarmaL: chocolate icing, dulce de leche filling, heath bar bits and French Toast: cinnamon & sugar, cream cheese filling, maple drizzle. Don’t wait for a chance to combine a trip to Purple Glaze with a shore trip. Go there today. It’s that good, making yourself wait would just be wrong.